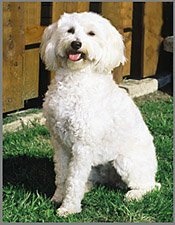 The Schnoodle temperament will vary from one dog to the next. However, there are some general characteristics that are common with many, if not most, Schnoodles. The Schnoodle is an intelligent crossbreed which is often full of energy and loves playtime. They generally interact well with other dogs. However, as with all puppies, early socialization with other dogs as well as a wide range of people is important. This teaches your dog to trust and be trusted. The Schnoodle temperament mixes the intellect of the Poodle with the companionship and devotion of the Schnauzer. If treated well when young, Schnoodles make loving, loyal and fun companions. 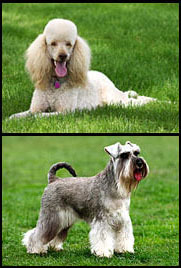 The Poodle is fun and energetic and so is the Schnauzer. Both breeds are intelligent and good natured dogs that enjoy the company of people and respond well to training. Both breeds are also sociable and can be stubborn! Poodles are highly intelligent dogs. They are obedient and active - Standard Poodles tend to be calmer than the Miniatures and Toys. They are good with children and other pets and are often shy with strangers. Schnauzers are devoted and loving. They make good watchdogs. The Standard Schnauzer is known as “the dog with the human brain”. The Miniature is alert and playful, sometimes almost childlike. The Giant is bold, loyal and often very protective of his owner. 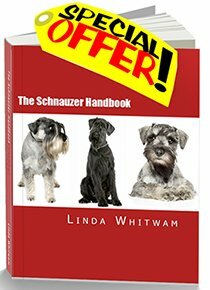 With the right education, Schnoodles are usually easily trainable, due to them often being eager to please. They also LOVE being with people - don’t think about getting one if you’re intending leaving your dog home alone all day. These are intelligent, alert and sociable dogs. Boredom or loneliness has been known to cause them to become destructive or bark all the time if left for long periods. By nature they are generally affectionate, devoted to the family and have a great sense of fun. They are also gaining a growing reputation in agility and flyball competitions. Due to their intelligence, high trainability and love of humans, some Schnoodles are now being used as therapy dogs in hospitals, schools and nursing homes. As far as exercise goes, they are very adaptable. Of course, a Giant Schnoodle will need a lot more exercise than a Toy, but they are not particularly known for their stamina. What Exactly is a Schnoodle? Schnoodle Puppies - Saviors or Scoundrels?